The 4015 SDI-12 to Analog Converter can be configured to provide a 0-1mA, 0-20mA, or 4-20mA current output with 0-5 volt output always available. 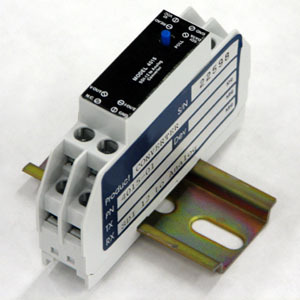 The connection to the data transmitter or measurement system consists of continuous power (10 to 33VDC), ground, and a switched read voltage (5 to 33VDC) that enables the analog output. With the read terminal energized, power consumption increases to the sum of the current output (20mA max) and an additional 4 mA (max). With the SDI-12 to Analog Converter's read terminal de-energized, current drops to less than 500 uA. Required to set up the converter or make any changes to setup and calibration information if the client does not have access to be able to program the converter through an SDI-12 bus.